Hi Frank, Great catch! 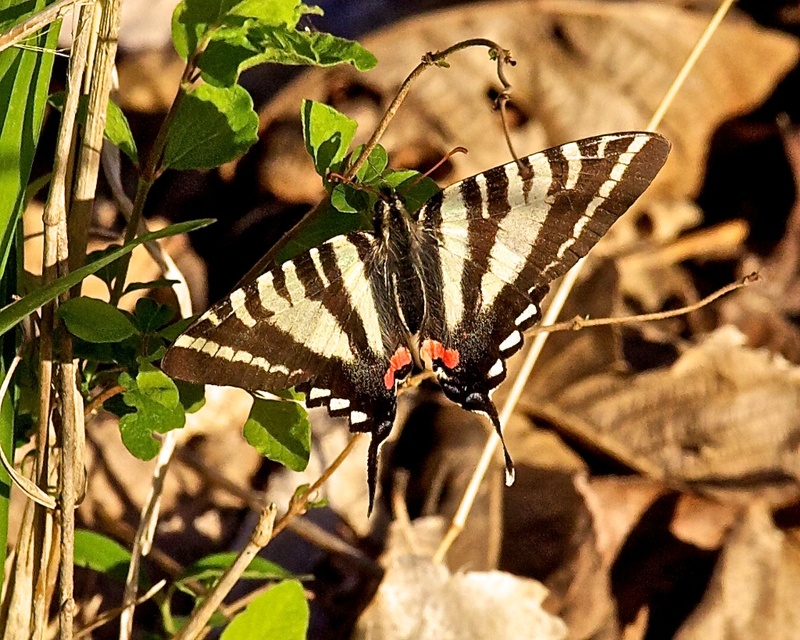 Because of the pale color, I’m wondering if you might have a Tiger Swallowtail, rather than a Zebra. There are Eastern and Western varieties; I checked them out athttps://www.google.com/search?q=swallowtail&hl=en&prmd=imvns&tbm=isch&tbo=u&source=univ&sa=X&ei=TM1vT9v7JM7egQfR6Yhs&ved=0CGUQsAQ&biw=1206&bih=597#q=swallowtail&hl=en&sa=X&tbm=isch&prmd=imvns&bav=on.2,or.r_gc.r_pw.r_qf.,cf.osb&fp=80f61e7c9086b795&biw=1206&bih=597. I agree with you completely that it’s too early for such warm-weather harbingers and share your deep concern. What have we done to this world of ours? The red spots on the rump give it away as a zebra. I think the Tigers have blue spots.